Conservation easements are effective only on private, deeded land and are costly, but there are significant tax and other benefits. Protection in perpetuity is assured because the land trust that owns, monitors yearly and enforces the easement has a non-optional, legal duty to insure compliance with the terms and conditions of the easement that controls activity on the property. ACEC designation is available to a tenant or other entity of federal land overseen by the Bureau of Land Management (BLM). An ACEC designation is less costly than a conservation easement, but more difficult to procure as the granting entity is the BLM, and they are a bureaucratic agency obligated to support the “multiple use” doctrine enshrined in federal law that must accommodate mining, cattle ranching, camping and other authorized uses. This legal mechanism to restrict uses and activities is well established and works for smaller parcels of deeded, private land. This is an inexpensive tool but has no immediate financial benefits. Protection of the land in the future is far less secure than with a conservation easement, because there is no land trust to monitor and enforce the requirements of the deed restriction. Rather, enforcement is available only to those who are beneficiaries of the restriction, and enforcement is optional and must be pursued privately. Legal expense is the responsibility of the person asking a court to enforce the deed restrictions. We know of no means for protecting state land but are working on it. Conservation easements provide significant income or tax benefits in order to provide land owners with incentives to protect property from development that fractures habitat. ACEC designations are granted based on the need to protect important riparian corridors, threatened and endangered species, habitats, cultural and archaeological resources and unique scenic landscapes. The Pitchfork Ranch map linked below shows ownership categories and, when so much ranch land is “checkerboard,” how difficult it is to completely protect range land. 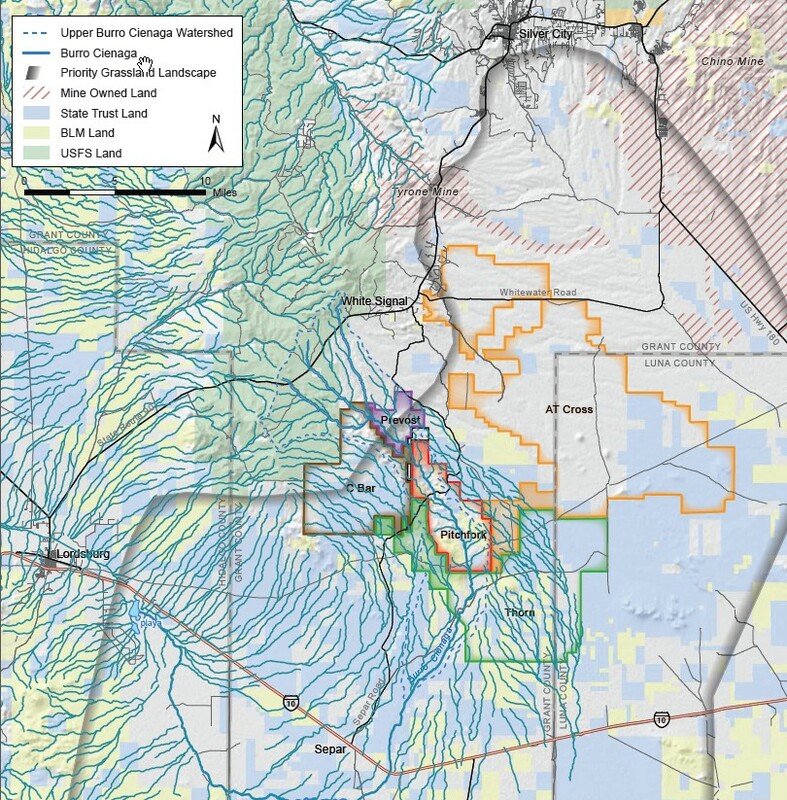 The Pitchfork Ranch - [ Pitchfork Land Ownership Map ] The map illustrates ownership classifications:  deeded or private land,  deeded land with subsurface mineral rights owned by the federal government or private party,  New Mexico state leased land and  federal land overseen by BLM.